Idiopathic epiretinal membranes (ERMs) are frequently being diagnosed in elderly patients, and they have an incidence of 2%–20%. An ERM is a semitranslucent, glial, and fibrocellular proliferative membrane. They develop on the surface of the internal limiting membrane, particularly on the macular surface, following partial or complete posterior vitreous detachment. Idiopathic ERMs are primary, whereas secondary ERMs can be due to trauma, inflammation, surgery, photocoagulation, or cryotherapy. Contraction of the ERM may cause irregular folds, and this exerts anteroposterior and or tangential traction on the retina and nearby retinal vessels. Eventually, it causes retinal layer distortion and visual symptoms. Hence, early detection of ERM is essential for documentation and follow-up purposes. Digital imaging being employed in multimodal techniques has revolutionized modern ophthalmic practices. Digital photography has the advantage over previous film-based techniques because it can produce instant, reproducible, high-quality images which can be transmitted to clinicians, to be used for the immediate diagnosis and management of various eye conditions. The main advantage of digital photography is that it enables direct comparison's against the images taken from previous visits. Conventional fundus photography (CFP) gives a full representation of the clinician's view of the retina. It has been successfully used for many years to document, follow, and in some cases, to diagnose retinal disease. 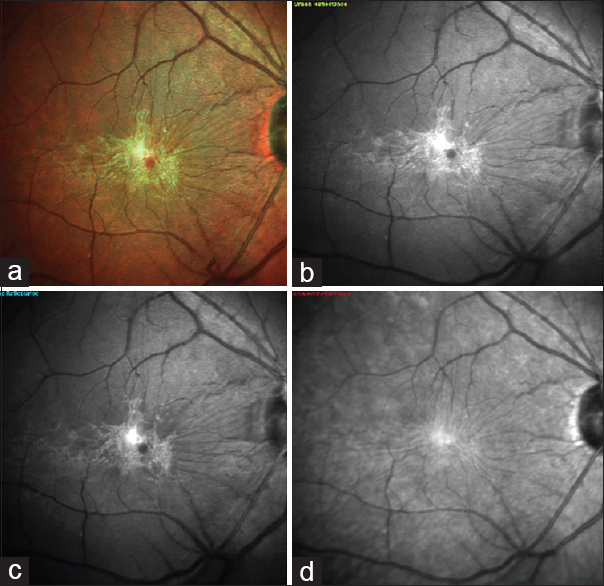 However, the limitations of CFP include the following (1) media opacities, (2) limited resolution, poor contrast, and (3) illumination and interpatient variability of fundus pigments hindering with image analysis. The scanning laser ophthalmoscopy (SLO) systems with added advantage over conventional techniques have also been introduced.,, Recently, Heidelberg Spectralis (Heidelberg Engineering) has combined multicolor SLO with their optical coherence tomography (OCT) fluorescein angiography system., The Spectralis scans the retina in three different laser wavelengths, including blue (486 nm), green (518 nm), and near-infrared (815 nm). A pseudocolor image is obtained by combing all three wavelengths. The three monochromatic images used allow visualization of distinct information from specific layers of the retina and choroid. Blue laser (486 nm) captures the superficial retinal details; green laser (518 nm) provides vascular details and surface retinal diseases. Near-infrared laser (815 nm) penetrates deeper into the retina due to the longer wavelength, allowing better imaging of the retinal pigment epithelium and the choroid. The images obtained by using the multicolor system are pseudo-colored and, in most of the cases, resemble the clinical fundus images. We share our observations made with the multicolor imaging system while analyzing ERMs in comparison with conventional color fundus photography taken at our institute. Patients with macular disease such as ERM routinely undergo color photography for documentation purposes. Presence of the ERM was clinically confirmed by slit-lamp biomicroscopy. Multicolor imaging was performed at the time of spectral domain OCT (SD-OCT) scanning. Pupils were dilated, and a full retinal examination was performed by a retina specialist. SD-OCT was performed taking 49 horizontal scans over 20 x 20 degree area with HRA2 (Heidelberg Retina Angiograph-Optical coherence Tomography, Heidelberg Engineering, Heidelberg, Germany). Wavelengths of HRA2 SD-OCT are 870 nm for SD-OCT. Acquisition speed of SD-OCT is 40,000 A-scans per se cond with a depth of 1.9 mm. Optical resolution for SD-OCT is approximately 3.8 μm axial and 6 μm lateral in high-resolution mode. Wavelengths of HRA2 for infrared images were 815 nm. CFP was obtained using the Carl Zeiss FF450 plus IR fundus camera in the same sitting. The camera offered three separate field angles at 20°, 30°, and 50°, with a viewing magnification of ×11, ×19, and ×29. Image processing was done using the integrated Zeiss VISUPAC digital imaging system. It uses a flash-based photography system and includes 25 flash levels with a rate of 1 flash/second. This takes not much of additional time or risk to the patient. Photographs were taken on the same visit using CFP. Images acquired by the CFP and MC were analyzed side by side. The clarity of the image, the ERM margins, and retinal folds were compared. Furthermore, features on SD-OCT were analyzed. We did not use any grading system to evaluate or grade the ERM. 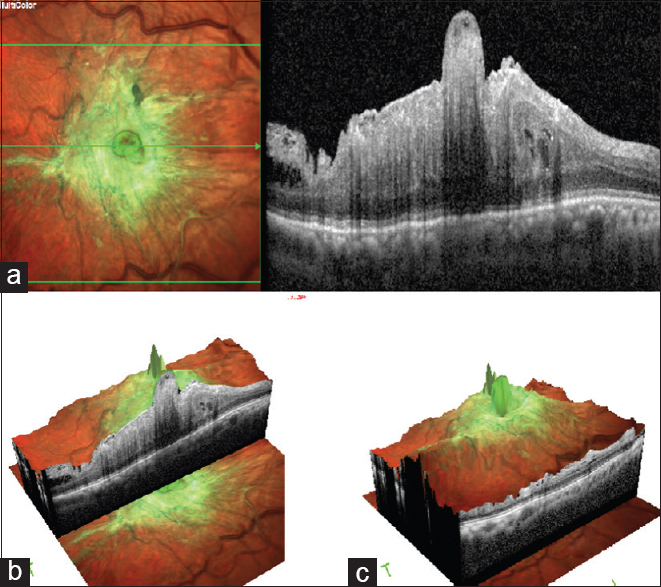 Multicolor imaging can be performed nearly simultaneously with OCT and/or retinal angiography using the Spectralis. In our experience, we found that details such as the foveal center and the orientation of the folds, which characterize this pathology, were better seen on MC when compared to CFP [Figure 1]. The color rendering of the multicolor image is not the same as what is seen on a fundus examination [Figure 2]. Multicolor images did provide a better delineation of the surface folds than a CFP. Standard fundus photography is the most common imaging modality to document what can be seen by the ophthalmologist clinically. Since CFP employs flash photography, it can be uncomfortable to the patient. It also requires better media clarity and pupil dilatation when compared to multicolor images. Hence, CFP may be time consuming in a busy clinic. The ERMs were best visualized on the HRA2-based green and blue laser multicolor en face SLO images. These were followed by another en face-based multicolor images [Figure 3]. The infrared and the fundus autofluorescence modes available on the HRA2 did not show the ERMs clearly. Spectralis OCT excitation wavelengths are 486 nm for “blue” and 518 nm for “green” laser; this explains why the en face images are better for detecting epiretinal structures such as ERM compared to a CFP. Previous investigations into multicolor imaging have also focused on other chorioretinal diseases.,,,,, Reznicek et al. compared HRA2 (Heidelberg Engineering) to wide-field SLO (Optos PLC, Dunfermline, United Kingdom), found out that ERMs were best visualized in HRA-based green-blue enhanced multicolor en face SLO images, followed by other en face HRA-based multicolor images and SLO en face visualizations obtained with Optomap. The Optos SLO uses only red (633 nm) and green (532 nm) wavelength lights when capturing the color composite view. They also showed that the SDOCT-based thickness map provided a good visualization of the ERM, but showed in the 54.7% of patients, a larger or smaller extension of the ERM border compared to SD-OCT cross-sectional images [Figure 4] and [Figure 5]. The multicolor imaging may be performed simultaneously with OCT using the Spectralis, and hence, making this mode of detecting ERM clinically useful. Spectralis also can acquire multicolor OCT in N-phase acquisition mode. This allows the user to view the OCT in three-dimensional (3D) mode. In Multicolor image, the membrane is seen as a green or yellow layer in contrast to usual gray-white appearance obtained by real color pictures. Hence, preoperatively, a surgeon can use this 3D image to get familiarized with the orientation of the ERM and plan the surgery. Multicolor imaging thus works as a digital staining technique in ERM. This may provide an added advantage in the preoperative analysis of ERMs [Figure 6]. A major advantage of the MCI over OCT alone is the ability to visualize the entire posterior pole and visualize the wrinkling of the retina by evaluating the retina en face. In conclusion, the ERM folds which were used to quantify the ERM objectively  can be visualized clinically, on color fundus photography, on OCT, and on MCI. Of the multimodal techniques used, MCI provides the best resolution and detail on the retinal folds associated with ERM. MCI is a test that can be performed very quickly at the time of OCT as a method to detect and follow ERM in an en face imaging technique. When looking at the separate cSLO images obtained using different wavelengths, green reflectance provided more information than blue or infrared reflectance. Our observations go with the previously published data suggesting that MCI on Heidelberg Spectralis may be used as an additional tool for the evaluation of ERMs; a combined imaging may give more detailed and accurate information about the disease. Multicolor imaging has the advantage of fundus images to be taken with a single device without the need for an additional color fundus camera. 3D imaging in ERM using MCI can be further explored. Hence, in tackling ERM, multicolor can be confidently used as an additional tool. Pearlstone AD. The incidence of idiopathic preretinal macular gliosis. Ann Ophthalmol 1985;17:378-80. Michels RG. A clinical and histopathologic study of epiretinal membranes affecting the macula and removed by vitreous surgery. Trans Am Ophthalmol Soc 1982;80:580-656. Yannuzzi LA, Ober MD, Slakter JS, Spaide RF, Fisher YL, Flower RW, et al. Ophthalmic fundus imaging: Today and beyond. Am J Ophthalmol 2004;137:511-24. Age-Related Eye Disease Study Research Group. The age-related eye disease study system for classifying age-related macular degeneration from stereoscopic color fundus photographs: The age-related eye disease study report number 6. Am J Ophthalmol 2001;132:668-81. Ben Moussa N, Georges A, Capuano V, Merle B, Souied EH, Querques G, et al. MultiColor imaging in the evaluation of geographic atrophy due to age-related macular degeneration. Br J Ophthalmol 2015;99:842-7. Freeman WR, Bartsch DU, Mueller AJ, Banker AS, Weinreb RN. Simultaneous indocyanine green and fluorescein angiography using a confocal scanning laser ophthalmoscope. Arch Ophthalmol 1998;116:455-63. Bartsch DU, El-Bradey MH, El-Musharaf A, Freeman WR. Improved visualisation of choroidal neovascularisation by scanning laser ophthalmoscope using image averaging. Br J Ophthalmol 2005;89:1026-30. Lee BR, Bartsch DU, Kozak I, Cheng L, Freeman WR. Comparison of a novel confocal scanning laser ophthalmoscopy algorithm with optical coherence tomography in measurement of macular thickness and volume. Retina 2009;29:1328-34. Pang CE, Freund KB. Ghost maculopathy: An artifact on near-infrared reflectance and multicolor imaging masquerading as chorioretinal pathology. Am J Ophthalmol 2014;158:171-8. Grading diabetic retinopathy from stereoscopic color fundus photographs – An extension of the modified airlie house classification. ETDRS report number 10. Early treatment diabetic retinopathy study research group. Ophthalmology 1991;98:786-806. Ahmad MS, Carrim ZI. 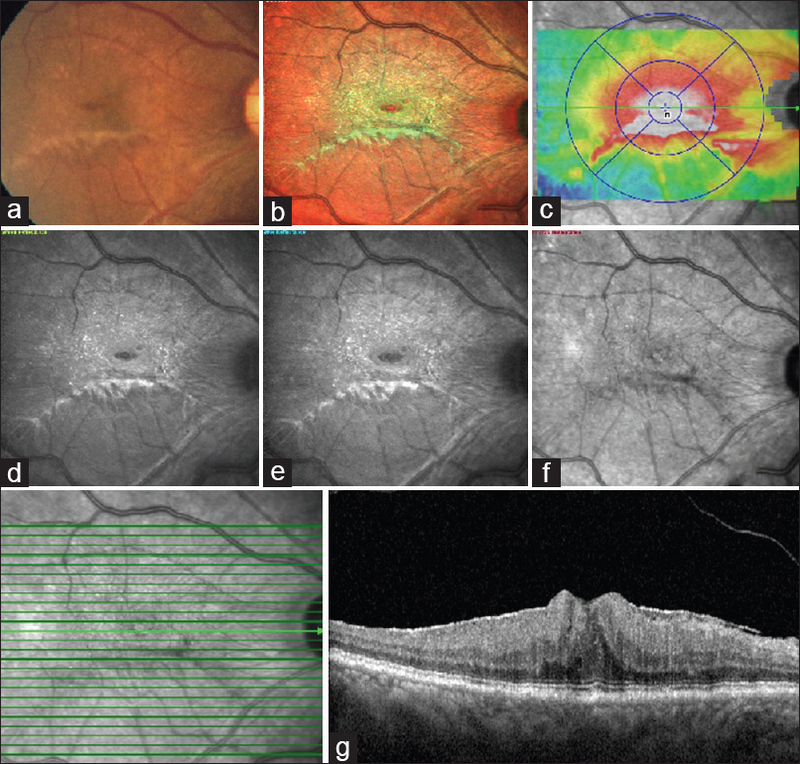 Multicolor scanning laser imaging in diabetic retinopathy. Optom Vis Sci 2017;94:1058-61. Graham KW, Chakravarthy U, Hogg RE, Muldrew KA, Young IS, Kee F. Identifying features of early and late age-related macular degeneration: A Comparison of multicolor versus traditional color fundus photography. Retina 2017. doi: 10.1097/IAE.0000000000001777. Murphy R. Multicolor fundus imaging prepares for debut. Retina Phys 2012;9:77. Yehoshua Z, de Amorim Garcia Filho CA, Nunes RP, Gregori G, Penha FM, Moshfeghi AA, et al. Comparison of geographic atrophy growth rates using different imaging modalities in the COMPLETE study. Ophthalmic Surg Lasers Imaging Retina 2015;46:413-22. Reznicek L, Dabov S, Kayat B, Liegl R, Kampik A, Ulbig M, et al. Scanning laser 'en face' retinal imaging of epiretinal membranes. Saudi J Ophthalmol 2014;28:134-8. Kilic Muftuoglu, et al. Visualization of macular pucker by multicolor scanning laser imaging. Retina 2018;38:352-8.